Meaning & where to Open PPF? When can I withdraw from PPF account? How to Close PPF Account? Can NRI Invest in PPF account? Can I transfer my PPF Account? What is PPF and Who can open it? PPF i.e. Public provident fund is a small savings and investment schemes which was started from 1968 by ministry of finance in India. The motive behind starting this scheme was to mobilize small investments by providing interest on it along with tax benefit. Any person who is a Indian Citizen can invest in PPF account. However NRI's can only continue to hold their account. A person should be more than 18 yr old to open a PPF account. There is no higher age limit. Where to open PPf account? One can open a PPF account in any authorized bank by visiting any of it's branch. Or you can also open online PPF account by visiting the banks website. Below given is the list of authorized banks where you can open your PPF account. A PPF account can be opened at Post office also by submitting required forms along with the documents required. Opening a PPF account is a very simple process which can be completed in 2 steps only. Visit the nearest branch of an authorized bank or a post office. Submit the form for opening PPF account along with the documents. Address proof - Electricity bill, Telephone bill, ration card etc. Carry your original documents to the bank or post office where you are going to open your PPF account for verification purpose. Make sure the photocopies you are going to submit are self attested. PPF is a long term investment. The rate of interest on PPF is decided by government which changes every year. The interest rate on PPF is computed on the minimum balance in an individuals account from the 5th day to the last day of the month. So if you are planning to deposit lumsum in your PPF, make sure you deposit the money before 5th day of the month to get the interest for that complete month. Earlier the interest rate on PPF was fixed for a year. But since last few years it is observed that it is fluctuating every quarter. Lock-in period is the period for which your investment is locked. If you want to withdraw the invested money before completing the lock-in period then you have to pay some penalty on it. In case of PPF, the lock-in period is of 15 years. You can not withdraw your PPF money before completing this lock-in period. Although there are some exemptions where you can withdraw some part of your PPF but not the entire amount. Once you complete the 15 years of lock-in period, you can withdraw you PPF money anytime you want. If you don't want to withdraw the money and want to extend the lock-in period then you can extend it for a block of next 5 years, with or without contribution in it. You can extend it for as many times as you want because there is no limit for extending the lock-in period of your PPF. But then again your money will be locked for 5 years and you can not withdraw it before completing the extended lock-in period. PPF is a tax saving investment tool which falls under EEE (exempt-exempt-exempt) tax category. Which makes this investment tool more attractive specially if it is invested for retirement purpose. The amount in PPF account is categorized into 2 parts. One is the capital component or principle components which is your contribution, and another part is the returns or interest earned on that principle amount through our the years or maturity. You contribution to PPF upto Rs.1.5 lacs is exempted from tax under section 80C. So if you invest in PPF upto Rs.1.5 lacs you can claim tax benefit while filing income tax return. If the investment exceeds the limit then tax will applicable on the remaining amount as per the income tax slab. This part is completely tax free. Which means you don't have to pay any tax on the returns generated though the PPF. Your contribution to the PPF accounts of spouse or child is also eligible for tax deduction. EPF or Employee Provident Fund is an investment scheme administered by EPFO (Employee's Provident Fund Organization). There is no particular lock-in period for EPF, You can take the money at the time of retirement of in case of resignation. But to avail the benefit of tax exemption you should keep your money in EPF for at least years. EPF has a tax exemption benefit under 80C if you continue the account for at least 5 years. Tax will applicable if you withdraw from your EPF before completing 5 years. A person can apply for loan on EPF for the only reasons which are disclosed by EPFO by submitting the required documents. PPF or Public Provident Fund is a tax saving investment scheme introduced by National Savings Institute of Ministry of Finance. PPF also has a tax benefit under 80C if you withdraw it after completing the maturity period. Tax will be applicable if you withdraw before completing the lock-in period. A person can apply for loan on PPF from the 6th year upto the 50% balance on 4th year. PPF is a long term savings scheme which has a 15 years lock-in period and you can not withdraw the money from your PPF account before completion of its maturity period. However you can make a partial withdrawal in case of any emergency form the 7th year onwards. How to withdraw from PPF account? Now the process of withdrawing PPF have became easier. You can withdraw the money from your PPF account after its maturity at any time from anywhere. Go to the bank where you have your PPF account and submit the documents there. If you are living somewhere else right now then visit the local branch of that particular bank where you have your PPF account and get your documents attested by the authorizes person. Once the bank completes the process of verification and attestation, either the bank will send your documents to the main branch or you will have to do that by yourself. In case the bank is going to send your documents, take an acknowledgement letter from the local branch with their signature on it. Once the original branch gets your documents, they will process them and credit back your PPF maturity amount by NEFT/RTGS. How to make a partial withdraw from PPF account? After completing 7 years you can make a partial withdrawal from your PPF account. You can withdraw 50% of your 4th years balance in case of any emergency. The process for partial withdrawal is similar to the process as I said above. Note that the years considered here are financial years which means from 1st April to 31st March. In case of emergency like serious ailment or higher education of child. The account must have completed 5 Financial Years. For this early closure of PPF the account holder needs to pay 1% of the interest as a penalty which will be deducted from his PPF amount at the time of withdrawal. Can I close my PPF before maturity? As per the updated rule form April 2016, you can close your PPF account before completing the maturity period, but this happens only in particular case like higher education of children or serious ailment etc. In this case 1% of your PPF will be reused as a penalty charge for premature closure. Premature closure of PPF is allowed for only those accounts which has completed it 5 years, which means you can close your PPF before maturity after completion of 5 FY. NRI's can not open new PPF account in India. Although they can contribute and continue their PPF which was opened before changing their status from Indian residential to NRI. Earlier NRI's were not allowed to have a PPf in India. They need to close their existing PPF accounts once their status changed to NRI. If they still continue their PPF account then they were getting the interest rate similar to the interest rate of post office savings accounts. But now as per the updated rule from October 2016 NRI's also can continue their pre-existing PPF and the interest they will be getting on it will be similar to the normal PPF's of Indian residential's. Nominee is the person who has been registered by the account holder as a legal claimant for his PPF after his death. For this the account holder have to fill a separate Form E and register the name of that person to whom hi wants to nominate for his PPF. In case of death of PPF account holder, the PPF money is transferred to the person who has been nominated by the account holder or to the legal heir of account holder if he/she has not nominated anyone. The claim process in both of these cases are different and it requires to submit some additional documents also. If the account holder has already registered nominee then the claim process will be easier in case of demise of the account holder. The Nominee in this case have to fill Form G and submit it to the bank where the PPF account has opened along with his ID proof, that's it. After completion of the process money will be transferred to the nominee. Claimant should submit all these document to the home branch of the bank and after completion of the claim process, bank will handover the money to claimant or the legal heir. Who can be the nominee? Nominee can be anyone of your family life your parents, spouse, kids or your grandchildren also. You can nominate two person also for your PPF (For example - your 2 children). In this case, if the nominees want to claim for PPF benefit after the demise of account holder then both the nominees should claim together. A cheque will be issue by the bank or post office where the PPF account is help and the cheque can be deposited only in the joint account of the nominees. Can I change the nominee later? nomination change from spouse to child or from child to grand child. Nominee change from mother to father or vise versa etc. The process to change nominee of your PPF is very easy. You just have to take Form F which is for nomination change, fill all the correct details carefully and submit the form to bank or post office where you have your PPF account. To explain in one line – “PPF interest is calculated monthly on the lowest balance between the end of the 5th day and last day of month, however the total interest in the year is added back to PPF only at the year-end”. You can check the interest on you PPF account also. 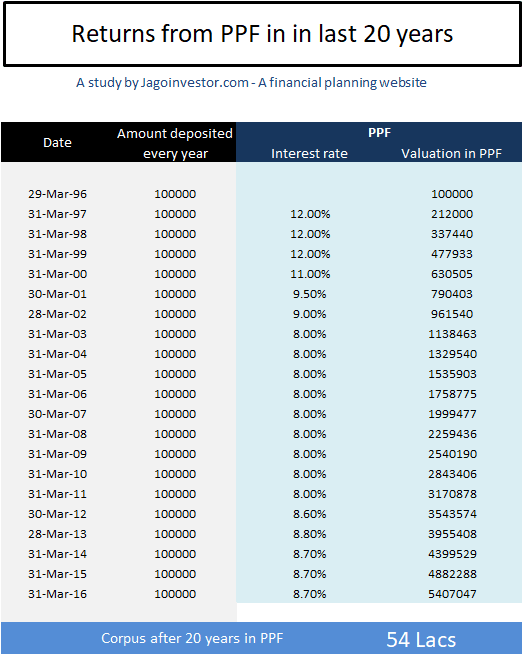 Click on the button given below to download PPF calculator. You can take loan of upto 25% of available balance at the end of that particular financial year from 3rd FY to 6th FY. After completion of 7th FY you can anyways make a partial withdrawal from your PPF, so after 6th year you can not take any loan against your PPF. You have to repay this loan within 36 months. The principle amount will be repaid first and once you pay the complete principle amount you will have to pay the interest part in next 2 month. The interest on this loan will be more that what you are getting on your PPF. You can not take second loan on your PPF until you repay the first one. What will be interests rate on PPF loan? The interest rate on PPF loan will be 2% higher than what you are getting on your PPF. For example - In this current year interest on PPF is 7.6% so if you take loan against your PPF then you will have to pay the interest 9.6%. As I said earlier that the interest on loan is depending upon the interest on PPF, this means if the interest on PPF changes then then interest on PPF loan will also change. You will have to pay this interest in 2 months after you repay the principle amount. What if I can not repay the PPF loan within 36 months? If you could not repay the loan within 36 months then the interest you will have to pay on the remaining principle amount will be 6% more than the interest you are getting on your PPF. For example - The current interest rate on PPF is 7.6% then the interest rate you will ave to pay on the loan after 36 months will be 13.6%. If you still don't relay the loan then the remaining principle and the interest applicable will be deducted from your PPF amount at the time of its maturity. As a guardian you can avail the loan on minor's PPF but for that you have to mention it clearly in that loan application form that "The account holder is alive and still minor. And the amount for which the loan is applied is for the best use of ...... (minor's name)". How many loans can I take against my PPF? You can take only one loan in one Financial year. Even though you repay the loan amount with all the interest within a year, you can not apply for a fresh loan in the same FY, you will have to wait for next FY. For example - If you had taken a loan in FY 2015-16 and repaid it within that FY. But still you can not apply for a fresh loan on your PPF in FY 2015-16. You can apply for loan in FY 2016-17.
Who will pay the loan in case of death of account holder? Nominee or the legal heir will be responsible to repay the loan in case of account holder's demise. The principle amount and the interest part will be deducted before closure of PPF account. These are the forms that you need to submit to the Bank or Post office at the time of opening new account, taking loan against existing account, making withdrawals or while closing the PPF account. ID proof - PAN card, voter ID, Aadhaar card etc. In case of no nomination legal heir's ID proof, certificate of succession, affidavit, letter of administration etc. in case there more more than one nominee and one among them died, death certificate of deceased nominee is also required. 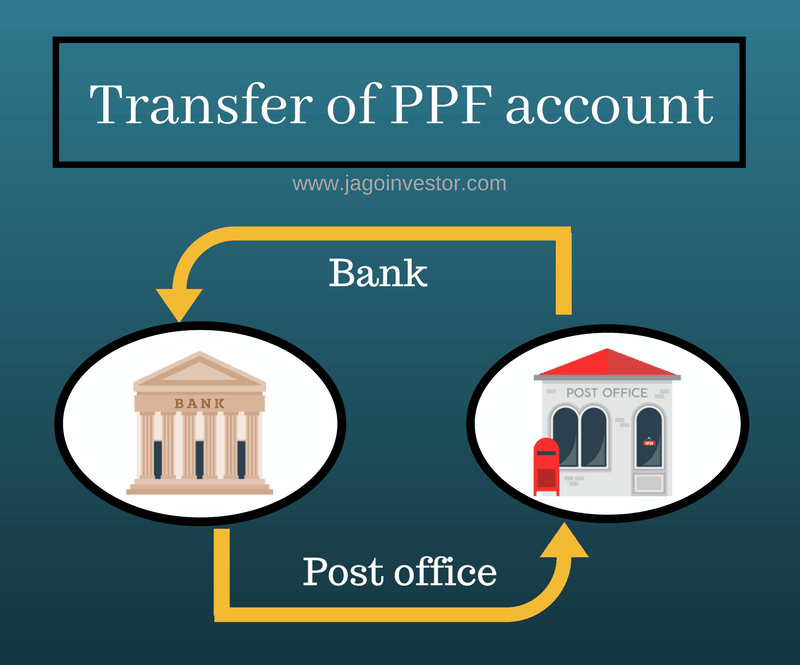 Submit PPF transfer form to the bank or post office where you have your PPF account. That bank or post office will send your original documents like account opening form, nomination form, specimen signature, etc to the branch address of the bank provided by account holder. Once bank/ post office receives the documents, they will inform the customer. The customer then again have to submit the documents like fresh PPF opening form (form A), nomination form (form E or form F in case account holder want to change the nominee), PPF original passbook, fresh KYC documents etc. to the bank or post office where they are going to transfer the account. Once you go through all this process your account will be transferred to the new bank branch of post office. This transfer is considered as a continuing account and thus will get all the benefits of the old PPF account. Automated investment is an automatic investment to your PPF account when money is deducted from your account on a regular basis automatically and gets invested into your PPF account. This process of auto deduction has proved helpful for lots of investors as it saves investors efforts of depositing money every time to their PPF. But his facility is not available at all the institutes. This automated investment facility in PPF is available only in some major and authorized banks. You can not get the benefit of auto investment if you have your PPF account at post office. Lot of investors close their PPF accounts because of this hassle of depositing the money everytime to their PPF. To such investors i would like to advise that instead of closing your PPF, transfer it to the bank where you can get the benefit of automated investment and also can continue getting the benefit of PPF account. How to withdraw from PPF after death? In case of death of account holder the nominee can withdraw the amount from PPF. If there is no nomination then the legal heir can claim for the PPF benefit. For this the nominee or the legal heir needs to submit form G.
If there are more than one nominee and one of them has died then the other nominee's has to submit the death certificate of the dead nominee also. If the subscriber has not nominated anyone and legal heir wants to claim for his PPF then he needs to submit other documents like succession certificate, letter of administration or copy of attested will etc. PPF is a savings and investment scheme introduced by government of India. So it is a safe investment tool. Besides this one more benefit of PPF is that your money in PPF will not be subjected to attachment by court law in case the account holder has any debt or liability which he could not repay. This means your PPF money is secured in each way it provides protection to your money from all the court decree and attachments. PPF account can be opened with just Rs. 100. You can start your investment from minimum of Rs.500 to maximum of Rs.1.5 Lacs per year. You can invest more that Rs.1.5 Lacs but then you will not get any returns on the amount above 1.5 lacs. The investments can be done as a lumsum at once or in maximum of 12 installments. If you are a contributor of any other PPF account also like the guardian of your child's PPF, then this limit of Rs.1.5 Lacs will be considered for both the accounts together. You can not open joint PPF account. It must be opened individually. You can deposit money to your PPF account either in cash, demand draft, Cheque or by online payment mode. PPF is an investment scheme offered by government of India. Here the returns are fixed and guaranteed, so there is no risk in the returns in PPF. The money is saved with banks or post office where you open the account so your capital amount is also safe in PPF. What if I could not deposit any amount in my PPF in a particular FY? You will have to pay Rs.50 as a penalty charge for every default year if you do not deposit at least Rs.500 to your PPF account every year. What is the eligibility to open a PPF account? 1. Only Indian residential individuals can open PPF account. 2. An individual can have only one PPF account. 3. Mother or father can open a PPF for their minor child as a guardian. However both mother and father can not open separate PPF for the same minor child. 4. Grandparents can not open PPF for their minor grand child. However in case of death of both mother and father, grandparents can open PPF for grandchild as a guardian. Will TDS deducted on maturity? No TDS will be deducted from your PPF after maturity as it is exempted form tax. How and where can I get my PPF passbook? You can get the passbook from the bank or post office where you have your PPF account. For that you need to visit that branch. How can i reactivate my discontinued PPF account? If you do not pay the minimum amount of Rs.500 per year your account will be considered as a discontinued account. To reactivate this discontinued account you will have to pay a penalty charge of Rs.50 for each default year along with the minimum balance of Rs.500 for each year. Can I continue my PPF after maturity and withdraw whenever I want? You can continue the PPF after completing its maturity period with or without contribution. However you can make one withdrawal of any amount in one financial year. Can a female subscriber change her name on PPF after marriage? Yes. A female account holder can change her name on her PPF account after marriage by providing the documents as a proof.